To prepare enchiladas: Preheat oven to 400°F. Coat a 7-by-11-inch (or similar-size 2-quart) baking dish with cooking spray. Spread about 1/4 cup of the sauce in the baking dish. Arrange 4 tortillas in the dish, overlapping them to cover the bottom. Top with half the bean mixture, using the back of a spoon to spread it thin. Scatter 2/3 cup cheese and 2 tablespoons onion on top of the beans. Top with one-third of the remaining sauce, 4 tortillas, the remaining bean mixture, 2/3 cup cheese and the remaining 2 tablespoons onion. Spread half of the remaining sauce on top and cover with the remaining 4 tortillas. Top with the remaining sauce and the remaining 2/3 cup cheese. 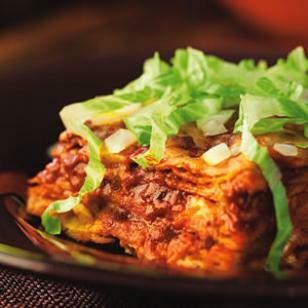 Bake the enchiladas until hot and bubbling, 15 to 20 minutes. Let stand for 5 minutes before serving. Serve with additional minced onion, if desired.